It's less than a day until my first race of 2010, the XTERRA trail run at Stillwell Woods. This will be the seventh time I've raced competitively since returning to running in 2008. I'm looking at tomorrow's event from a few different perspectives. First, it's a race and that in itself creates excitement. Second, the action of participating in a rigorous 5 mile trail race less than two months after a week's stay in the hospital validates my recovery from severe pneumonia. Third, this race promises to be the single most challenging running experience I've ever faced due to the course and the conditions we'll be facing. This morning my son and I stopped by the race site to see how the trails were looking. 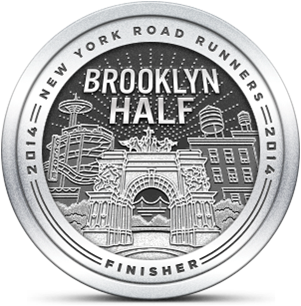 They hadn't marked the course but the website says we'll be running the "black trail." I'm not too familiar with Stillwell's trail markings (which explains why I always get lost when I run in the interior of the preserve) but I'll try to pay closer attention tomorrow. 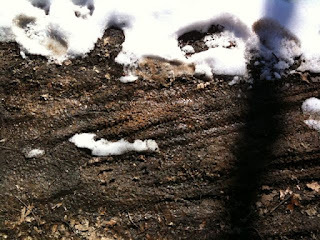 Once we arrived at Stillwell I realized that there's still quite a lot of snow on the ground. As we walked to the trail head we saw that the first 300 yards of the course are covered by a few inches of well-trod icy snow. 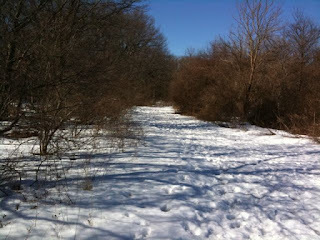 We followed the main open trail until we came to path that broke to the right and led into the woods to the south. The path was less snow covered due to the trees but there was still enough to warrant careful footing, especially when the trails twisted and dropped. 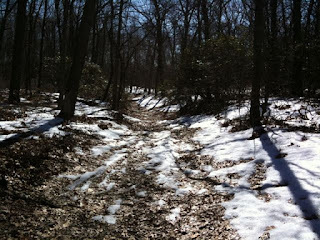 We continued our hike in the woods and as our trail rose we encountered lots of mud from the melted snow. I was imagining 100+ runners packed together, racing on a narrow trail and kicking up lots of muddy water. My friend KWL suggested that I wear goggles to protect my eyes from the spray but I'm going to have to tough it out with just a pair of glasses. Although we didn't travel too far on our hike I managed to get a little lost, but my 10 year old son navigated us successfully back to the main trail. I wish I could bring him tomorrow. The weather at 10 AM was still chilly and it's made me rethink my plan to wear only one or two light layers. I'll bring some extra clothes to the race which I can leave behind with my "crew" if I decide I don't need them. It's now exactly 16 hours to the start. I hope I can sleep tonight! good luck, Looks like a tough trail!